Take our Bible courses directly on our Web site! You can study the lessons of Cyberspace Ministry’s Bible courses directly on our Web site. Two different versions are available, depending on whether you wish to get pictures or not. Please bookmark this page so you may easily carry on with these Bible courses. The Moment of Truth is a 41-lesson course, helping you study the Bible in a systematic way. 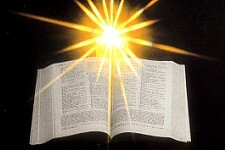 Lesson after lesson, at your own pace, you will discover the wonderful treasures hidden in the Word of God. Click here for more comments about The Moment of Truth. If I Were Told the Future is a 102-lesson course, helping you study Bible prophecy in a systematic way. Lesson after lesson, the Bible, and the Bible only, will make you discover the many keys giving access to the secrets of Bible prophecy’s wonderful world. This is an advanced course. We suggest you to study first the course The Moment of Truth before moving on to this one. Click here for more comments about If I Were Told the Future. The Last Countdown is a 39-lesson course showing the perfect harmony in the organization of the Bible’s last days prophecies, each of these prophecies following a rigorous and sound structure which describes exactly the same sequence of events leading to Jesus Christ’s return. This Bible course is definitely more advanced. The access to this course is therefore restricted. The required password will be given only to the students who have successfully completed our previous two Bible courses The Moment of Truth and If I Were Told the Future, having studied all the lessons and successfully completed all the tests in both courses. To get a foretaste of this Bible study, you can access without the password the lesson God’s Process of Progressive Revelation. Click here for more comments about The Last Countdown.